First of all, if your image is stolen you DO own the copyright. It doesn't matter if a big company or an individual has stolen your artwork | design | image it's still copyright infringement. The worst part about this is that big company do this & think they can intimidate the smaller business or individual because of their size. This is what a big company did via a message when a person in a facebook group I was part of asked for help about this very situation. I told her that they should know that any image found by doing a simple Google search still needs to be researched for copyright information. This is why we have stock image sites that offer personal and commercial-free licences. If it was the other way round, the big companies would have had the person pull the image from her website straight away. How come I know so much about this well this happened to me. It wasn't a big company that used my design image but a designer. My design came up for a popular search term and a lady thought it was a great image (which is was). However, she decided to use it for her own design needs and add her own words to my image and off it went all over the internet Pinterest, Facebook & Instagram. There were hundreds of my design floating around, at one point I thought to forget it. Its great people like it right, wrong. No one knew I designed it, and that was the issue. This woman was taking all the credit. So I went through Pinterest, Facebook and Instagram an got all but 2 I think taken down. It took a while but it was worth it. On Pinterest, you have to contact the accounts that have your images and tell then they are infringing on your copyright without knowing, which you understand as they just pinned it. Can they please remove the image ASAP. As you will be coming back to see if it has been done. Some will ask for proof that it's your images others will say "it's all over Pinterest you can't do anything about it". (that was a real reply from a person). When you have contacted all these people and they have not done as you have asked. You go all legal my friend and contact Pinterest copyright section. You will have to fill in a form and share every single URL your image is on. Plus you have to share links to the original image and your information. What Pinterest will do is simply pull down all those URLs for you. I wish I saw the woman's face when Pinterest did what she thought couldn't happen. Its the same for Facebook contact all the people and ask nicely. Then if they don't listen again go through Facebook copyright infringement section. Again another form to fill in with all the urls your image is on. Instagram was harder as Instagram didn't help and the 2 accounts did not respond or remove my design but as I commented saying this is my image and you are infringing on my copyright. Everyone who sees that post will also see my comment which is not good for that business. Your next step after dealing with Pinterest, Facebook and anywhere else your image is. It's time to deal with the big company. Firstly I would write a very formal email explaining that they have used your image and that they are infringing on your copyright. 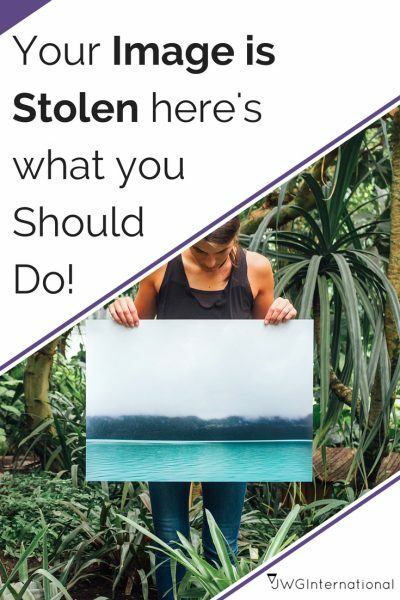 You did not give permission for your artwork | design | image to be used. If they had contacted you and asked, and where willing to add a credit then this may not have been an issue. Obviously is your call if you want to add that line in your message. Depending on where your image | artwork | design was taken from, it's professional practice to find and contact the original creator to either ask for permission or see what licence it holds. Ask for your image to be removed immediately and that you will check to make sure this has happened on their end. If you send your message and you either get no reply or a not so nice reply. Send another message being sterner and using legal information. If you do a search online you can find legal content to help you write your message. You can also approach DMCA, who can help you get your image | artwork | design was taken down. Now if you go this route with DMCA it will cost you money $199. So you decide to use this option, you can use it within your second more stern message. O.k now I have explained everything here's what you should do first before contacting Pinterest or Facebook direct. 1) First, you need to find every single url which has your image on it. Save them to your internet browser favourites its easier to check if they have removed your image or not that way. Create 2 folders one will have all of Pinterest urls an the other will have Facebook url. Also, copy and paste all these image urls into a word doc as you will need to copy and paste these urls into forms for Pinterest or Facebook if the people do not remove your image. Do the same for Facebook but send the above message (of course change Pinterest to Facebook) to their private message inbox. It will take a while but even as a small business owner you can still be heard. This is a horrible situation to be in. Have you being in this situation, or are you going through it now? Also, share any tips you used to solve your situation, It will benefit others reading this post and the comments. Which of these are you not doing on your blog?